As part of our 50th Anniversary, join us for a one-time-only celebration of music, culture and community! For the first time ever, we’re hosting a concert and community fair in the University of Lethbridge Community Stadium. Enjoy a summer evening of outstanding music from award-winning artists, followed by a free day of arts and culture, food and drink, song and dance, sporting events and fun for all ages to round out your university’s 50th. September 2 | 12:30 – 11 p.m.
September 3 | 10 a.m. – 4 p.m.
Multicultural Demonstrations | Face-Painting | Family Activities | and More! 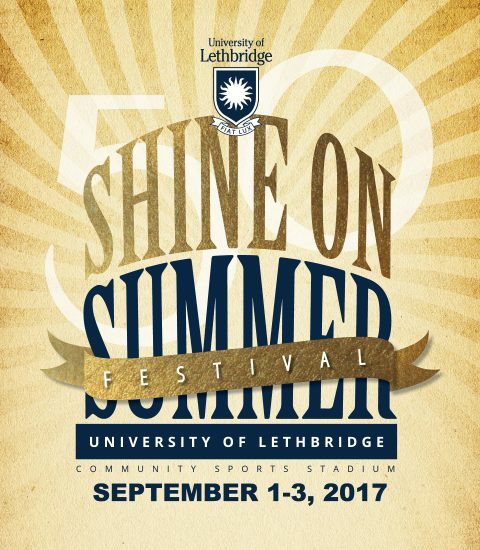 The Shine on Summer Festival is presented in partnership with the ENMAX Centre, the City of Lethbridge and presenting sponsors Lethbridge Lodging Association and TD Insurance Meloche Monnex.